Deva (Romanian pronunciation: [ˈdeva] ( listen); Hungarian: Déva, Hungarian pronunciation: [ˈdeːvɒ]; German: Diemrich, Schlossberg, Denburg; Latin: Sargetia; Turkish: Deve, Devevar) is a city in Romania, in the historical region of Transylvania, on the left bank of the Mureș River. It is the capital of Hunedoara County. Its name was first recorded in 1269 as castrum Dewa. The origin of the name gave rise to controversy. Some thought that the name is of old Turkic origin from the name Gyeücsa. Others assert that the name is probably of Slavic origin where Deva or Devín means "girl" or "maiden". (A similar case exists in Slovakian for the Devín Castle, located at the confluence of the Danube and Great Morava, at the site of the former town of Devín.) It is also considered that the name comes from the ancient Dacian word dava, meaning "fortress" (as in Pelendava, Piroboridava, or Zargidava). Other theories trace the name to a Roman Legion, the Legio II Augusta, transferred to Deva from Castrum Deva, now Chester (Deva Victrix) in Britain. Additionally, it is possible the name Deva was derived from the reconstructed proto-Indo-European dhewa ("settlement"). On medieval maps Deva appears as: Dewan (first mention), Deva, or later Diemrich. Documentary evidence of the city's existence first appeared in 1269 when Stephen V, King of Hungary and Duke of Transilvania, mentioned "the royal castle of Deva" in a privilege-grant for the Count Chyl of Kelling (Romanian: comitele Chyl din Câlnic). Under Voivod John Hunyadi, Deva became an important military and administrative centre. Partially destroyed by the Ottoman Turks in 1550, it was afterward rebuilt and the fortress extended. In 1621 Prince Gabriel Bethlen transformed and extended the Magna Curia Palace (also known as the Bethlen Castle) in Renaissance style. In 1711–1712, Deva was settled by a group of Roman Catholic Bulgarian merchant colonists, refugees from the unsuccessful anti-Ottoman Chiprovtsi Uprising of 1688. The colonists were originally mostly from Chiprovtsi and Zhelezna in northwest Bulgaria, though also from the neighbouring Kopilovtsi and Klisura. 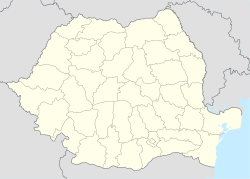 However, the colonists came to Deva from Wallachia and from Alvinc (now Vinţu de Jos, Romania), where a similar colony had been established in 1700. The Bulgarian merchants, who in 1716 numbered 51 families and three Franciscan friars, established their own neighbourhood, which was known to the locals as Greci ("Greeks", i.e. "merchants"). Their influence over local affairs caused Deva to be officially called a "Bulgarian town" for a short period, even though the maximum population of the colony was 71 families in 1721. The Bulgarians received royal privileges of the Austrian crown along with their permission to settle and their acquisition of land and property. The construction of Deva's Franciscan friary commenced in 1724 with the funding and efforts of its Bulgarian population, so that the monastery was commonly known as the Bulgarian Monastery. However, the Great Plague of 1738 and the gradual assimilation of the Deva Bulgarians into other ethnicities of Transylvania prevented the colony from growing and by the late 19th century the Bulgarian ethnic element in the town had disappeared completely. Deva is situated in the central part of Hunedoara County, on the left bank of the middle course of the Mureș River at 187 m above sea level. The city administers four villages: Archia (Árki), Bârcea Mică (Kisbarcsa), Cristur (Csernakeresztúr) and Sântuhalm (Szántóhalma). Automotive, commerce, construction materials and power industries are important to Deva's economy. Deva is dominated by the Citadel Hill, a protected nature reserve because of its rare floral species and the presence of the horned adder. Perched on the top of the hill are the ruins of the Citadel built in the 13th century. Tourists can visit the Citadel by climbing the hill or using the cable car. The machinery covers a distance of 160 meters and it can transport up to 16 people. Deva's tourist attractions include the Arts Theatre, the Patria Cinema, the Old Centre and the Citadel Park, where there are the statues of Mihai Eminescu and Decebal and the Magna Curia Palace. There is also the Aqualand Complex, a recently built leisure centre situated near the Citadel Park. It is an important tourist spot for the Transylvania region. Downtown the city, the House of culture and the musical fountain represent two elements that basically define the centre of Deva. Deva is considered the Gymnastics capital of Romania because the National gymnastics training center is located within the city. Many of the country's Olympic gymnasts have trained in Deva. ^ Fundaţia Jakabffy Elemér; Asociaţia Media Index; Attila M. Szabó. "Dicţionar de localităţi din Transilvania" (in Romanian). Retrieved 17 April 2010. ^ Octavian, Floca (1969). Hunedoara ghid al judeţului (in Romanian). Deva. p. 50. Argumente de ordin lingvistic dovedesc că Deva îşi are originea într-un nume slav-sudic(Deva – fecioară). ^ Octavian, Floca; Ben Bassa (1965). Cetatea Deva. Monumentele patriei noastre (in Romanian). București: Editura Meridiane. p. 14. ^ a b "Populatia" (in Romanian). Orasul Deva. 11 April 2012. Retrieved 28 August 2012. ^ a b Балкански, Тодор (1996). Трансилванските (седмиградските) българи. Етнос. Език. Етнонимия. Ономастика. Просопографии [The Transylvanian (Sedmigradsko) Bulgarians. Ethnicity. Language. Ethnonymy. Onomastics. Prosopographies] (in Bulgarian). Велико Търново: ИК "Знак ‘94". pp. 111–115. ISBN 9789548709163. ^ Телбизов, Карол (1984). Български търговски колонии в Трансилвания през XVIII век [Bulgarian merchant colonies in Transylvania in the 18th century] (in Bulgarian). София: Издателство на Българската академия на науките. p. 17. OCLC 490158032. ^ Octavian, Floca (1969). Hunedoara ghid al judeţului (in Romanian). Deva. p. 50. Deva, localitate de reşedinţă a judeţului Hunedoara, situată în stînga Mureşului, la poalele ultimelor ramificaţii dinspre nord ale munţilor Poiana Ruscăi, la înălţimea de 187 m deasupra mării, deşi este o localitate relativ mică, numărând 34982 (1968), este totuşi un oraş pitoresc, important centru administrativ şi cultural – animată aşezare pe cursul de mijloc al Mureşului. ^ "Medii lunare multianuale 1961–1990". Administrația Natională de Meteorologie (Romanian National Administration of Meteorology) (in Romanian). June 2011. Retrieved 22 April 2010. ^ "Arhivă meteo". Administrația Natională de Meteorologie (Romanian National Administration of Meteorology) (in Romanian). Retrieved 22 April 2010. Wikimedia Commons has media related to Deva.